My wife's sister and niece came up to Seattle for a visit.. we were so sad when she left that we had to console ourselves with Mexican food. ...and what goes with Mexican food kids??? 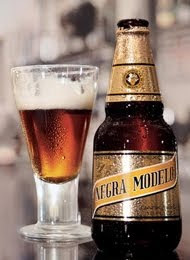 Negra Modelo (with a shot of Patron). Is she holding a glass of melted butter?